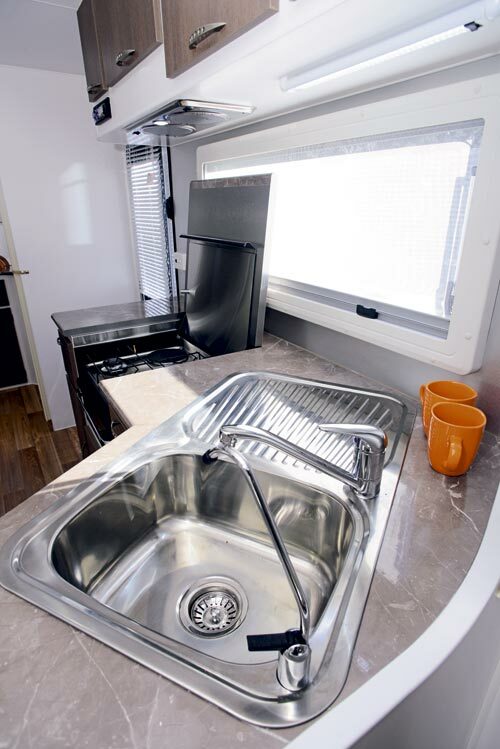 Aussie Wide Caravans is proud to be one of the small-to-medium players in the caravan business, completing just two caravans a week to individual customer order. Now in its eighth year, Aussie Wide is very comfortable at that volume. 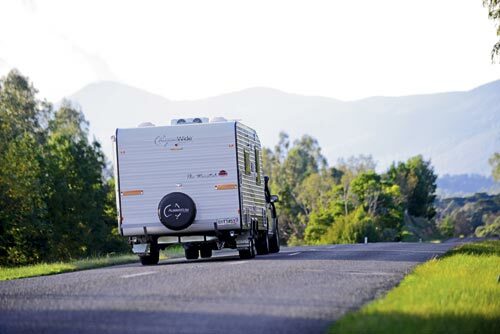 Available in lengths from 17ft 6in to 21ft, the Waratah is the smallest and cheapest model in Aussie Wide’s three-tier range, sitting below the range-topping Bunderra, which you can have in 21-30ft, and the 18-21ft Destination, which is really the Bunderra’s smaller brother and shares much of its underpinnings. All are built to order and come with tandem axles, except the 30ft Bunderra which is, by necessity, a tri-axle job. All come in a single ‘all-road’ spec, rather than two-tier ‘touring’ and ‘offroad’ models, which has become the norm in the industry these days. At first glance, the Waratah strikes a familiar pose. 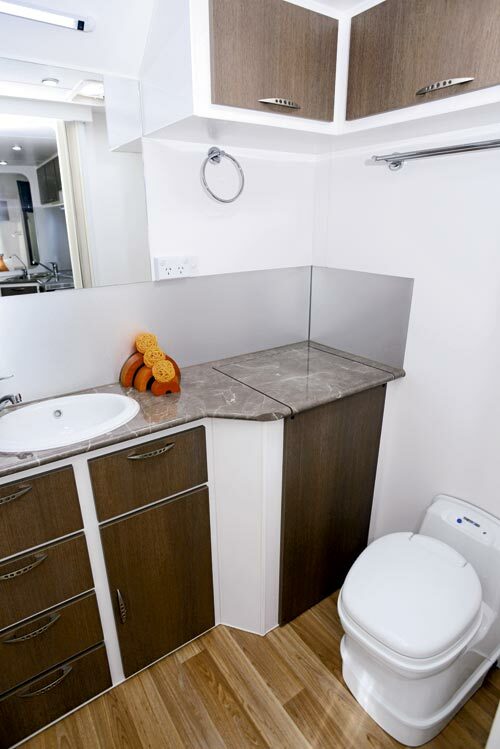 It’s a conventional caravan, using standard proprietary equipment such as Dometic double-glazed windows, a Dometic awning, ribbed aluminium cladding, lower-body black checkerplate and a proven meranti timber frame. But look more closely and you will see that Aussie Wide has, for the most part, been particularly selective when shopping for suppliers and their wares. The AusTrail-sourced SuperGal chassis is a good starting point. 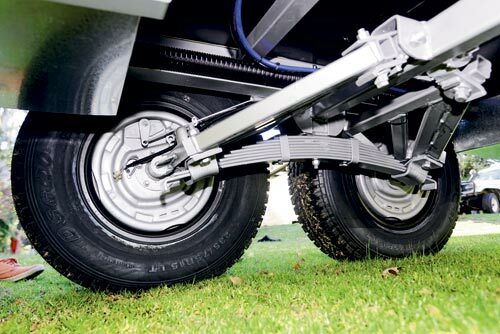 It features a quality finish, from the rounded A-frame end, beautiful seam welding, satin smooth silver finish, hooks to keep the chains out of the mud when not in use, and guides for the handbrake cables to avoid chafing. They are small but impressive details when you look under as many caravans as we do. On the Waratah, the A-frame rails are actually larger (150x50mm) than the main chassis members (100x50mm) to help keep the Waratah’s Tare weight as low as possible, making even our 20ft model easy meat for a mid-sized 4WD to tow. Aussie Wide’s ‘semi-offroad’ underpinnings are actually designed to cope with whatever long distance touring that typical Australian roads can offer up. Load-sharing Simplicity suspension was fitted to our test van and, combined with the tough tyre/wheel package, the extensive black checkerplate on the lower body and front of the van, and the Hyland ball coupling with its impressive articulation, it made the Waratah look as though it would be as comfortable on the Tanami Track as on the Stuart Highway. The exception here is the low-slung battery box, ahead of the axles on the driver’s side. It contrasted with the careful shielding of the tap on the A-frame and the twin water tanks below and looked unnecessarily vulnerable to damage. Another great feature on the A-frame is Aussie Wide’s unique ‘quick fill’ system, which allows you to rapid-fill the twin 95L water tanks from a mains pressure hose using the drawbar-mounted tap. You can still top up the tanks via the two conventional fillers on the offside of the body, but why would you? More good thinking has gone into under-body storage. The front tunnel boot is huge – almost large enough for two people (if you’re so inclined to test that theory) – and there are two separate lockers on the rear offside of the van, one of them big enough to house a portable generator. The only minor issue is that the drop-down door of the upper hatch fouls the side-hinged door of the lower one, making it difficult to have both open at the same time. But that’s a minor detail. And if something won’t fit into one of the exterior hatches, there’s a lot more storage room under the queen-sized bed. Another feature that will be appreciated by taller travellers is the full-height 1.9m door – something some other makers skimp on. There are few surprises inside the Waratah test van. 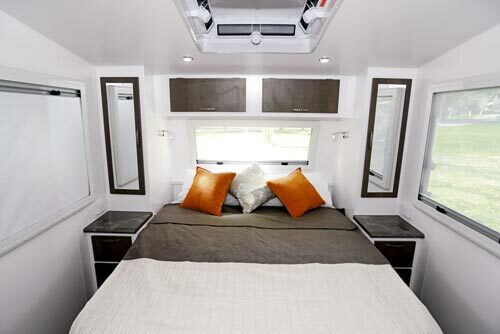 And while the front island bed, centre galley, café dinette and rear ensuite with its separate shower and toilet are all there, it somehow feels more spacious than its 6.1m internal body length. Some of the credit goes to the clever design of the kitchen, which is separated from the bedroom by two large bulkheads and a concertina privacy screen. One side of the kitchen accommodates the deep-bowl home-kitchen-sized angled sink while, opposite, the 164L three-way Thetford fridge with Sharp microwave above is immediately accessible. 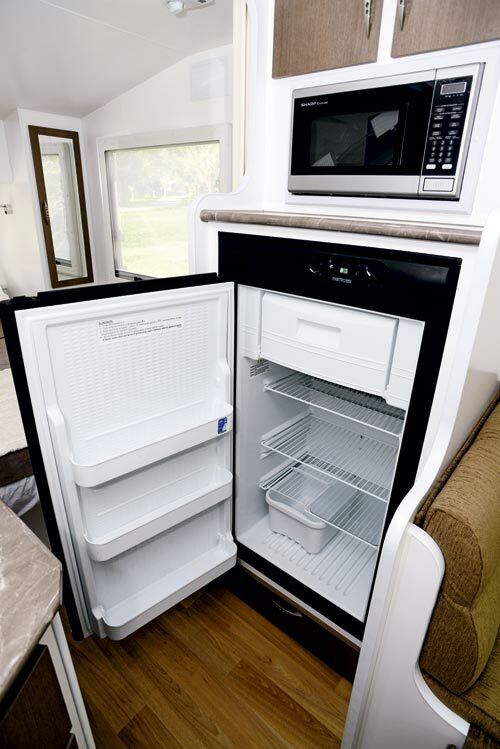 The fridge space is actually large enough to house a monster 258L unit, which Waratah normally fits, but the smaller unit was specified by the test van’s future owner. Thoughtful features here include the left-hinged fridge door, which gives full access from the kitchen, and the handy shelf in front of the microwave which allows you to rest hot items before serving. 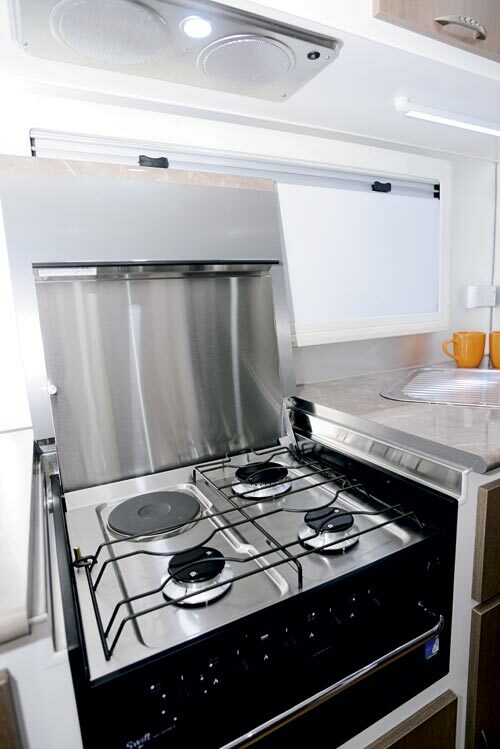 Bench space is good when you drop the cover on the cooker, and the 25mm solid timber benchtop adds to the impression that this caravan is built to last. 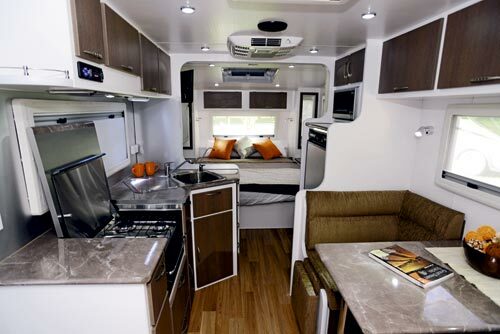 The cooktop is opposite the café-style dinette which, as well as a tri-fold table that can accommodate two adults and two children, has drop-down footrests on each end. These are ideal for putting your feet up and relaxing after dinner to watch the standard 19in LED TV, which pivots on an arm above the sink, and they are probably strong enough to hold a small child each, at a pinch. I wasn’t taken by the woven upholstery used in this van – leather would have really lifted the quality look of the interior, but this can be specified by customers, along with a multitude of other décor options. The large 400x400mm Dometic Mini Hatch above the kitchen/dinette floods this area with natural light to supplement the van’s standard LEDs. 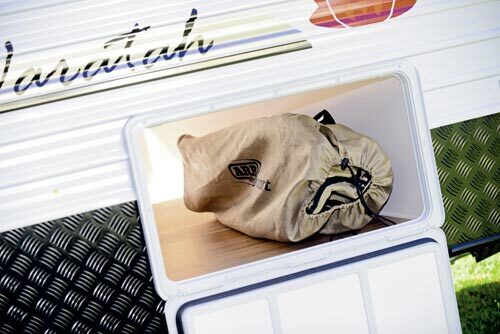 At the rear of the van is the self-contained ensuite, separated from the dining area by a concertina screen. 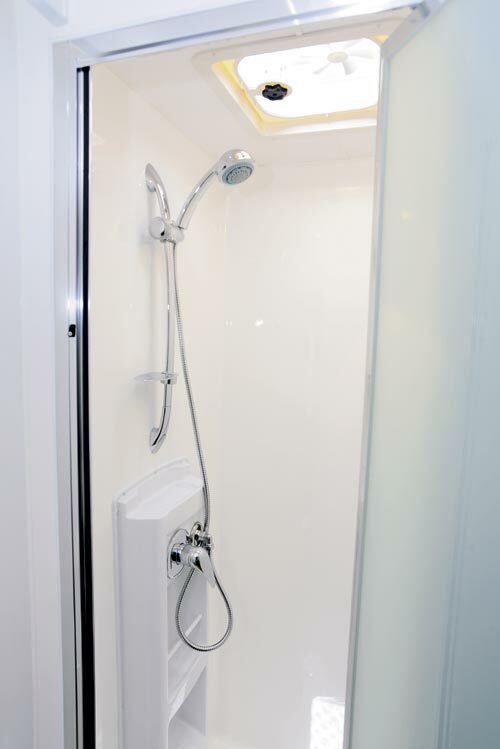 It contains a fibreglass shower cubicle, a central vanity unit with basin and the Thetford swivel toilet to the right, next to the cabinet containing the van’s top-loading 2.2kg Lemair washing machine. It all works very well in a relatively modest space and makes you aware of how much real estate is often wasted in larger vans. 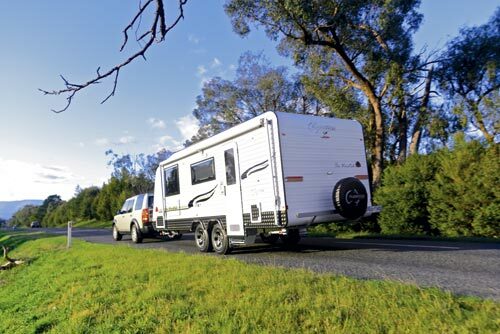 With its Tare of 2350kg, the Waratah is capable of being towed by medium-sized 4WDs. There is little requirement for a serious rough-road spec, but Aussie Wide is confident that its vans will cope with all Australian main road conditions, sealed or unsealed. 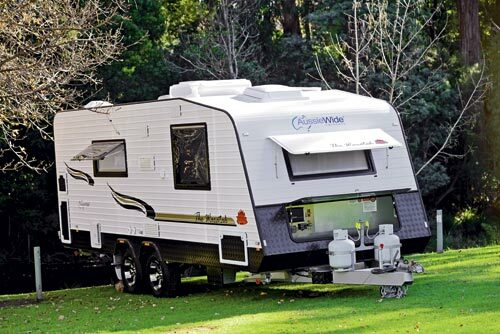 Like all Aussie Wide caravans, the 20ft Waratah we tested was built to a specific customer’s specifications, so what we saw was indicative of what you can get for just a tad under $60,000, rather than a rigid design. air of calm that is missing at many larger makers. When we collected the Waratah for review, several people were fussing over its detail, removing a small surface scratch, specs of dust that I couldn’t see, and apologising profusely because a supplier delay meant they were fitting some cupboard doors at the last minute. Then I was given a detailed walk-through, with things I could easily have missed pointed out and explained with pride. 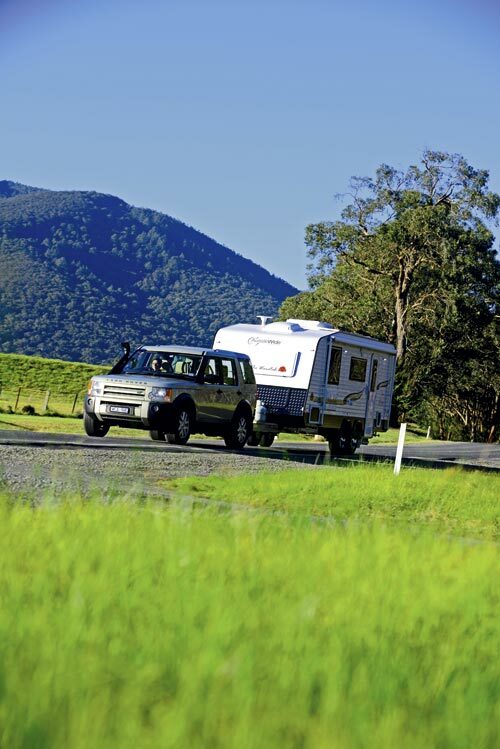 Aussie Wide works closely with its customers to ensure they get exactly the caravan they want and, while they don’t offer an off-road spec as such, customers get their choice of traditional Rocker-Roller leaf or coil spring suspension, additional ground clearance through chassis risers and a range of hitches to suit their tow vehicle and where they intend to travel.